Kerala SSLC SAY/Supplementary Examination Time Table 2019. 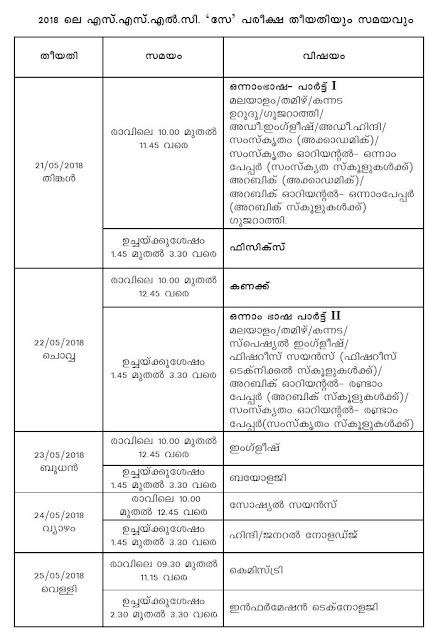 Kerala SSLC (10th Class) Supplementary (SAY) Examination June 2019 Time Table download from keralapareekshabhavan.in. Kerala Board of Secondary Education conducted SSLC Examinations from 13th March 2019 to 27th March 2019. Every year Kerala Board conducting SSLC Examinations in the month of March. Kerala SSLC Results was announced on 3rd May 2018. For the failed candidates in SSLC Examination in March 2018, SSLC Board conducting Supplementary Examinations in the month of May 2018. Kerala SSLC SAY/Supplementary Examinations conducting from 21st May 2018 TO 25th May 2018.